Center islands usually narrow the travel lane at the roadway centerline and separate opposing traffic movements. 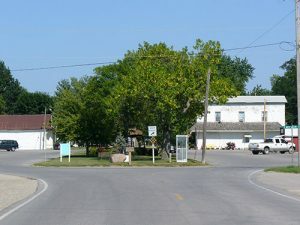 Center island in Drakesville, Iowa (Shauna Hallmark et al./Institute for Transportation). Center islands are usually raised islands, also called medians, within the roadway centerline. Center islands usually narrow the travel lane at the roadway centerline and separate opposing traffic movements. 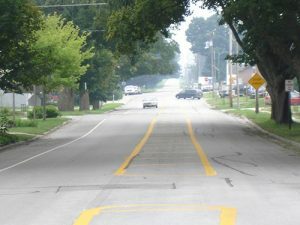 Use of pavement markings in Union, Iowa, as an alternative to raised medians (Shauna Hallmark et al./Institute for Transportation). Median treatments may be more effective when they provide a short interruption of traffic flow than when long center islands are used. The Crash Modification Factors Clearinghouse provides crash modification factors (CMFs) of 0.56 for fatal and major injury crashes and 0.29 to 0.61 for all crashes after installation of a raised median. Rural main streets must have adequate additional right-of-way for center islands. If they do, center islands are especially appropriate when turning movements should be restricted or channelized downstream of an intersection or in areas that would benefit from a pedestrian refuge. Design consideration for areas with heavy truck volumes or prevalence of large farm vehicles should be made so that larger vehicles can utilize the roadway. The use of a raised median is a significant capital improvement. Use of pavement markings may be a fairly inexpensive alternative to raised medians.